Flowers, lots of flowers here and there, people crying but laughing at the same time. Talking, lots of talking, voices that I recognise but I do not understand what they say, that is how I remember the day I buried my father. It was a commotion, a confusion and at the end we were alone, with no father. In the evenings, after he was gone, we used to sit down around the living room at my mum’s house and talk about the way he was like when he was alive, we joked about it, we would repeat his typical expression “Ai la tenemos”, “Ay! Mamá”, “Que tanto es tantito”, we did this for days or maybe weeks, I don’t remember now, all I remember is that for me and my family the world stop spinning for a few days and with our father part of our souls were gone, but at the same time, as Mexicans, we knew that everything was going to be ok, because we would see him soon, in our dreams, in our thoughts and he would come and visit us during the special day, the day when all the dead come back to the world of the living, “The Day of the Dead”. 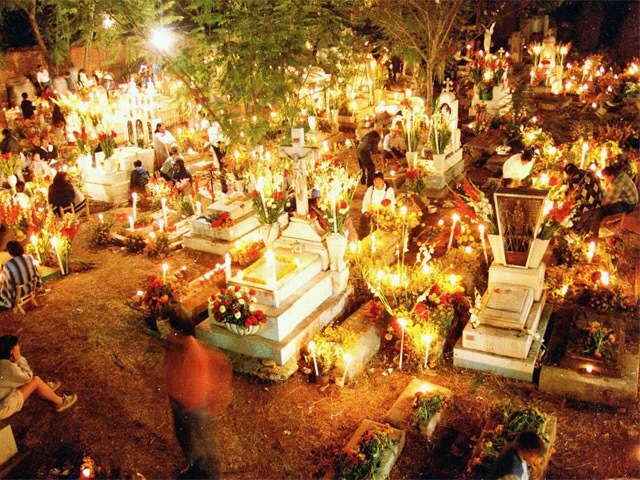 In Mexico every 1st and 2nd November is celebrated The Day of the Dead, it is a very special celebration full of traditions. On those days we visit the cemeteries and bring flowers, food, music to our loved ones that have passed away to a better life, we remember everything about the person that we go and visit, sometimes in a funny way, because that is the way we, Mexicans, are, we joke about everything, even about death. For Mexican people the cult to the Dead goes back to ancient times, for example, the Aztecs used to “Mictecacíhuatl”, La Señora de Mictlán, the lady of the dead. In my family my sister Cynthia sets an Altar for our father and grandparents in her house. I do the same in London, but in a small way and during that day I cook “Carne Asada” (bbq) which was my dad’s favourite food. The picture of the altar I am showing here is not in my house or my sister’s house. Unfortunately I do not have a picture of mine, but this is the proper way an altar is set. The Cempasúchil flower or Mary Gold flower is the traditional flower used during the festivities of the Day of the Dead, they are always present in the altars at home or on the graves in the cemetery, but everybody has its own traditions, for example, I always take sunflowers to my dad, as they remained me of the way he used to be, always shining! 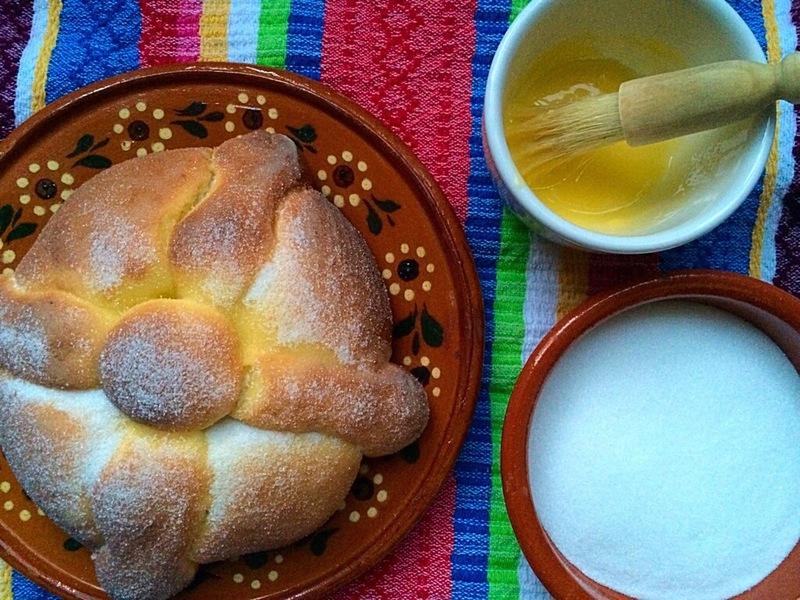 Another wonderful tradition made during the Day of the Dead is an orangey flavour sweet bread. People in Mexico eat them and use them as an “ofrenda” (offering) for the altar. During the last weeks of October all the bakeries around Mexico start baking this bread and people take them home and eat them with some nice cozy hot chocolate. The way this bread looks has a special meaning, the four long pieces mean the bones of the dead and the ball on top signifies the heart of the dead person and the orangey smell of “Azahar” remind us to the dead. When I was younger, my mum used to work in a Mexican bakery, so we always used to have fresh sweet bread at home and during “el día de los muertos” we used to eat lots with a hot chocolate. Just like pan de muerto, sugar skulls are very popular during this celebration. In Mexico all the markets have hundreds of them, nicely decorated. They are placed on the altar as part of the ofrendas (offerings) as well. Every family have their own way to celebrate the day of the dead, for example, in my family we tent to do a BBQ as that was my dad’s favourite thing. My whole family goes to visit his grave and have a little party until dawn. Everybody brings flowers and something to eat and stay there talking about my dad. Then at night they turn candles to light my dad’s way to the living world. 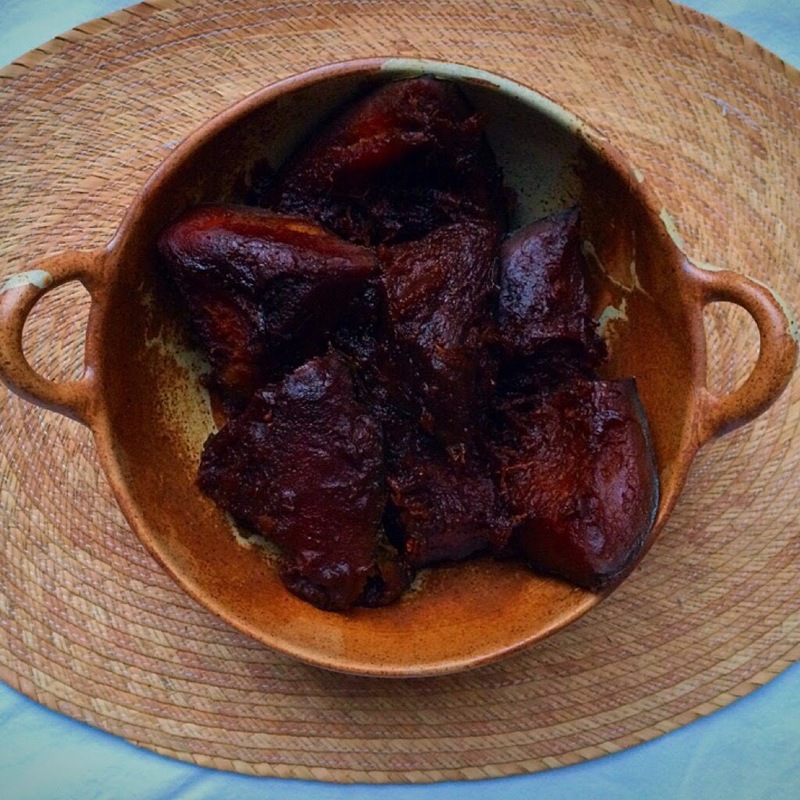 Other traditional recipes for this festival are Tamales and Calabaza en Tacha. Literary Calaveras is a tradition that goes back to vice-royalty times. José Luis Posada a cartoonist and printmaker was the main person to influence this movement, as he used to draw satiric skeletons cartoons of politicians witting comments criticising the government of those times. Literary Calaveras were banned for some time in Mexico by the government. Nowadays, literary Calaveras are rhymes usually written in a funny, satiric and ironic tone, pointing to defects and criticizing the vices of a selected person. I’m very lucky to live in a country where every year the Mexican community and the English people make a big effort to celebrate the Day of the Dead. Wherever or however you are celebrating the Day of the Dead this year, I hope you enjoy it a lot and may the souls of those love ones that have left come back to life! In memory of my lovely father who loved food, family, traditions and life to the most! Note: Some of the pictures I used here weren’t taken by me.